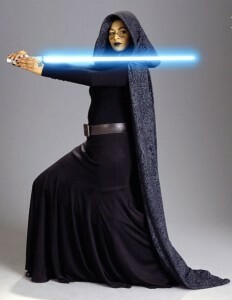 Barriss Offee was a Mirialan Jedi Knight and General during the Clone Wars. A skilled Jedi Healer, Offee utilized her abilities at a Rimsoo on Drongar during the galactic conflict. Trained by Jedi Master Luminara Unduli in the years leading up to the Clone Wars, Offee fought in tandem with her master in skirmishes on Ansion and Ilum. She carried a blue lightsaber and was a practitioner of Soresu. Around 20 BBY, after growing disillusioned with the Jedi Order during the Clone Wars, she orchestrated the bombing of the Jedi Temple, for which she framed Ahsoka Tano, resulting in Tano leaving the Order after her innocence was proved and Offee was exposed as the real bomber. Offee met her demise during Order 66 in 19 BBY on Felucia. 1. Blue raised textured or patterned cloak with large hood made of non-shiny material. The cloak should have a collar that wraps around neck and a front yoke. The front of the hood should loop up to attach to the bottom of the collar. Cloak should be long and reach just above the ground. 3. Must have a fitted hood or separate fitted cowl to cover and hide hair and ears. 4. Black or very deep, dark blue (colour should match top) flared full-length non ribbed skirt made of non-shiny drapey material. Skirt should be tightly fitted from waist to mid-thigh and flare to the ground. Top and skirt are to be two separate pieces. 5. Calf high or knee high black boots. Boots should have a heel but no higher than 4cms. 6. 19 Black Facial dimond tattoos with pale very light yellow base makeup. Lips should be black. 7. Tattoos also on top of the hands as well as black painted nails. Hands should also have the same yellow base. 8. Dark brown leather belt with heart-shaped decoration on buckle. Belt should be approx. 7-7.5cm in width. Buckle is approx.5-1cm thicker. Decoration is a love heart shape in a bronze and gold colour. There are also small gold dots around edge of decoration. 9. Lightsaber hilt (not a toy). If using a blade it must be blue.